1.) First download the guitar pro 6 installer for linux from the website www.guitar-pro.com. 2.) The downloaded file is in .deb container format (for Debian distributions). Simple extract the deb file, and open the extracted folder. 3.) You can find two tar.gz files inside of it: control.tar.gz and data.tar.gz as well as debian-binary. The only file which we need is data.tar.gz, so delete the other two files. This means GuitarPro6 tries to use a wrong version of libz. The trick is to remove the libz lib in the GuitarPro6 folder and let GuitarPro use the libz version of the system. 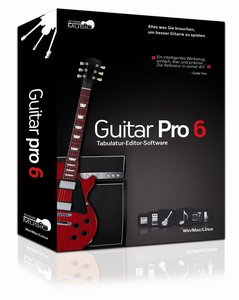 After that GuitarPro6 should be able to start. It should sucessfully import it, doing it this way. I hope everything worked out fine. You can also add a Desktop link to GuitarPro6 by adding a file in /usr/share/applications.